Q: Indian Prime Minister Narendra Modi and Chinese President Xi Jinping are highly likely to meet in Johannesburg on the sidelines of the BRICS Summit. Can you elaborate on the agenda of the meeting? Will the US protectionist policy be discussed between both leaders? A: Both President Xi Jinping and Prime Minister Narendra Modi will attend the BRICS Summit in Johannesburg, South Africa. As far as I know, on the sidelines of the BRICS Summit, President Xi Jinping is expected to hold bilateral meetings with leaders of relevant countries, including Indian Prime Minister Modi. We are still making relevant arrangements. This would be the third meeting between President Xi Jinping and Prime Minister Narendra Modi since their informal meeting in Wuhan in April, during which they will exchange views on issues of mutual interest, including on international situation, bilateral relations and BRICS cooperation. You also mentioned the US trade protectionism. Indeed, the US protectionist and unilateral acts have caused widespread and grave concerns worldwide. China and India are all staunch supporters of multilateralism and an open world economy, and we all oppose protectionism. On these fronts, our two countries share common grounds and common interests. In fact, this is also a view shared by the BRICS countries. Q: Palau Pacific Airways has recently said that it has been forced to suspend operations because of the decrease in the number of Chinese tourists who are using the airline. In a letter from its owner to Palau's National Congress, the airline said this is mainly because Beijing doesn't include Palau in its list of tour destinations due to a lack of diplomatic relations between the two countries. Do you have any comment on that? A: I am not aware of the situation you mentioned. You may have to ask the civil aviation and tourism authorities. Q: The US mission to the United Nations submitted a report to the United Nations, saying that the DPRK circumvented controls via ship-to-ship transfers and its oil imports are suspected of exceeding the yearly limit imposed by the Security Council sanctions resolutions. 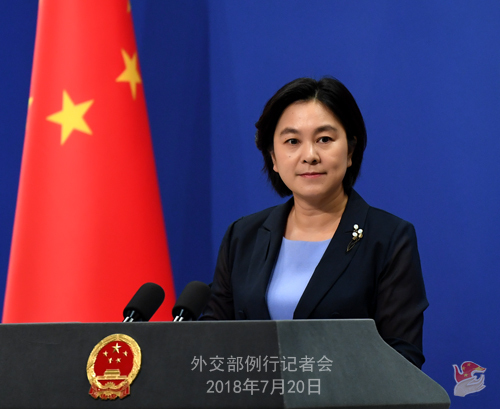 The US is calling on the Sanctions Committee to order UN member states to immediately halt all transfers of refined petroleum products to the DPRK, but China and Russia disagreed, saying they need more information in this respect, and thus put the US proposal on hold. What is China's comment? A: The UN Security Council Sanctions Committee on the DPRK is now deliberating this matter. We believe that in accordance with the relevant Security Council resolutions and the regulations of the Sanctions Committee, decisions on this matter should be made after thorough discussions based on solid and credible facts and evidence. Q: Peter Navarro, Director of the US National Trade Council, said that on the trade issue, it's a zero-sum game now between China and the rest of the world, and what the US needs to do is to work with the rest of the world to deal with it. What is your comment? A: Recently, some US officials did say quite a few ridiculous things that attempt to confuse right and wrong. Maybe it is because they need to placate their people who oppose and are upset by the US-initiated trade war. However, considering that Mr. Navarro is an important figure for the US trade policies and his words may mislead others, I believe I have to make some responses accordingly. First, it is China that has been calling out loud for discarding the Cold War mentality, self-centered egotism, and zero-sum game in which one's gain comes at the other's loss. The building of a community with a shared future for mankind has been incorporated successively in the Charter of the Communist Party of China and the Constitution of the People's Republic of China. 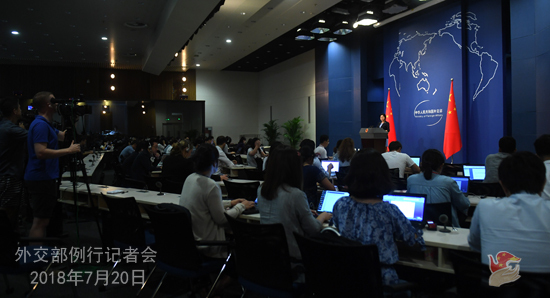 To build a new type of international relations featuring mutual respect, fairness, justice and win-win cooperation and a community with a shared future for mankind are the overarching goals of China's diplomacy. 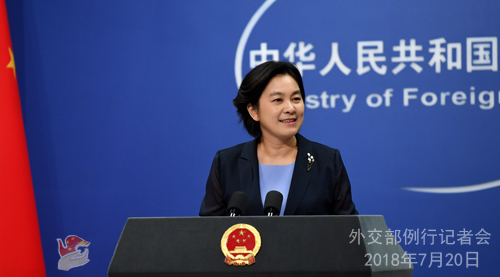 In its relations with other developing countries, China will continue to follow the approach of upholding justice while pursuing shared interests and the principles of sincerity, real results, affinity and good faith. China will work to upgrade solidarity and cooperation with them and will always be their trustworthy friends and sincere partners. All these efforts have been spoken highly of by other developing countries. Second, many American companies have made a bundle from the Chinese market, thanks to China's rapid economic growth and large consumer base. For example, China is the largest market for Apple and General Motors. In 2017, when General Motors Company lost RMB10.98 billion worldwide, its two joint-ventures in China still pocketed RMB13.33 billion's worth of profit. Qualcomm's sales in China accounted for 58% of its total revenue. The retail price for Apple's iPhone 7 starts at $649, but manufacturers in China only get less than 1% of the value. When China exports a US$ 450 worth of business suit to the US, China gets 5% of the profit while the US gets 84%. I am curious how the US side would like to explain these figures. Do they also want to cite these figures to prove that the US is shortchanged in its trade deals with China and China is playing the zero-sum game here with the US? Third, everyone is watching when the US side behaves like this in international relations, and everyone is hearing and seeing what the US officials are saying and doing. So, we all know what the whole world thinks of the US. It is quite obvious that some people in the US are so obsessed with their conjured-up reality that they simply cannot be waken up. However, by brandishing its wanton and striking indiscriminately while depriving others' right to self-defense, by blocking its own door while demanding others to unconditionally open theirs wider, by overriding others' interests and the international rules to serve its own political needs and selfish interests, the US has really taught us something in a piercing and profound way. I have noted that many US citizens and its allies have spoken out unreservedly. The US is now the biggest wrecking ball to world stability and certainty. Its unilateralism and protectionism pose the greatest threat to the international rules and the world economic order. I said the other day that knowing someone is intelligence but knowing oneself is real wisdom. Today I want to add that nothing could be more disastrous than chaos. As the No.1 power in today's world, the US should at least think about its responsibility before making relevant policies or saying or doing anything, because it is the "order" of the world that they are expected to promote, not "chaos".